I am sure you have all heard about Jack Black, no, not the actor, the brand of skincare. I had been hearing about the lip balm for a few YEARS, I will go as far to say. I dont know why but it just never interested me. I dont know, judge me if you must but yes, I judge a book my its cover. The packaging never drew me into the product. 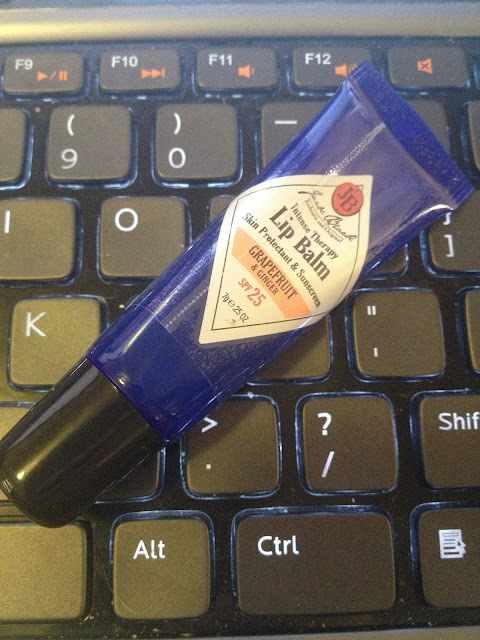 However, after hearing raves upon raves for this lipbalm, being the lipbalm junkie (errr... addict) that I am, I gave in. The first one I picked up with the Lavendar flavored one, and ew. Seriously, I put it on and make that lemon face. I couldnt even believe I picked this flavor because it smelled and tasted putrid. I usually love lavender. I guess I never thought that I might not like to rub it on my lips. Anyway, I spoke about it on twitter and everyone recommended the lemon flavor. I picked that one up and I liked it, a lot. Now I could maybbbeee see what all the raving was about. I like the consistency, its thick but not sticky and definitely is hydrating. This makes a great overnight lip treatment. I like to pile on, go to bed and wake up with super soft lips. Great. However, still the scent was not mind blowing. Fast forward to 2 days ago, I was in Blue Mercury and I saw the display case of all the flavors and for some reason, a little voice in my head said to buy the grapefruit flavor. I LOVE grapefruist scents, I like the zing! Lo and behold, I now am a believer. I am in LOVE with this scent. This scent makes me want to put it on everyday, all day. Who know the scent could make that huge of a difference? Anyway, I am now in love and recommend this lip balm (I dont think I have to tell you which one to buy...pretty obvious). I will be picking up a few more of these in the same flavor to litter around my apartment. Have you tried? Which is your favorite flavor? It's a nice and great post about beauty and skincare products.I have seen such a great information related to beauty products and want share with others may be its something batter for skin. Thank you for you good recommendation. When I severely like squandering a while go over that can, I'm sure steadily concerning this excellent and so experience being familiar with added concerning this type of difficulty. Currently simply click here payday loans Go on fantastic perform!